Consider the field magnetization characteristics of a d.c. shunt generator shown in the Fig. 1. The Fig. 1 shows that generator voltage builds in step till point A. 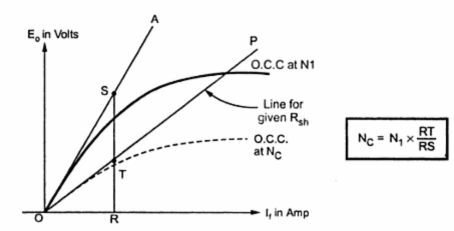 This point is intersection of field resistance line with the open circuit characteristics (O.C.C.). The voltage corresponding to point A is the maximum voltage it can generate. If the slope of field resistance line is reduced by decreasing the field resistance, the maximum voltage generator can build will be higher than that corresponding to point A. Similarly if the slope of field resistance line is increased by increasing the field resistance, the maximum voltage generator can build will be less that that corresponding to point A i.e. corresponding to point B. If now the slope of the field resistance line is increased in such a way that it becomes tangential to the lower part of the open circuit characteristics. The voltage corresponding to this point is EC. This voltage is just sufficient to drive the current through field resistance so that cumulative process of building the voltage starts. This value of field resistance is called critical resistance denoted as RC, of the shunt field circuit at given speed. Note : If field circuit resistance is more than RC at start then induced e.m.f. fail to drive current through field circuit and generator fails to excite at given speed. The critical resistance is the slope of the critical resistance line. Similar to the critical resistance there is a concept of critical speed. We know that E ? N. As speed decreases the induced e.m.f. decreases and we get O.C.C. below the O.C.C. at normal speed. If we go on reducing the speed, at a particular speed we will get O.C.C. just tangential to normal field resistance line. Note : This speed at which the machine just excites for the given field circuit resistance is called the critical speed of a shunt generator denoted as NC. Generally data for plotting the open circuit characteristics is given. Plot the characteristics on the graph paper to the scale. Draw the tangent, to the initial part of this O.C.C. then the slope of this line is the critical resistance for the speed at which the data is given. Note : If speed changes, then the O.C.C. changes hence the value of RC changes. Note : Generate the data for O.C.C. at new speed and repeat the procedure to obtain RC. It is known that as speed changes, the open circuit characteristics also changes, similarly for different shunt field resistances, the corresponding lines are also different. Note : The speed for which the given field resistance acts as critical resistance is called the critical speed, denoted as NC. Thus if the line is drawn representing given Rsh then O.C.C. drawn for such a speed to which this line is tangential to the initial portion, is nothing but the critical speed NC. 1. Drawn O.C.C. for given speed N1. 2. Draw a line tangential to this O.C.C. say OA. 3. Draw a line representing the given Rsh say OP. 4. Select any field current say point R.
5. Draw vertical line from R to intersect OA at S and OP at T.